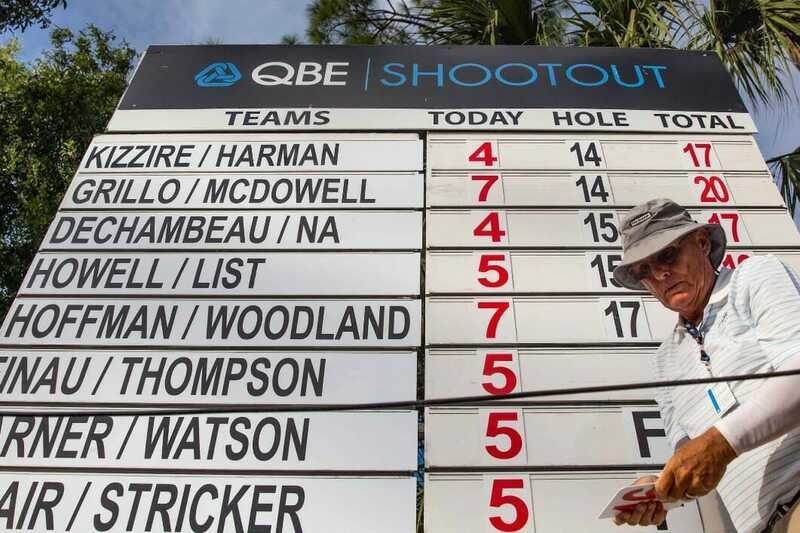 Graeme McDowell and his Argentine team-mate Emiliano Grillo are on the verge on becoming only the second ‘all-international’ team to capture the QBE Shootout near Naples in Florida. McDowell and Grillo head to the third and final round sharing the/Florida lead with all-American twin pair of Gary Woodland and Charley Hoffman along with Patton Kizzire and Brian Harman on 19-under par. Woodland, who has partnered McDowell twice before, combined with Hoffman and birdied their closing three holes in an eight-under par 64 in the ‘modified alternate shot’ format on day two of the $US 3.4m event being staged on the Tiburon Resort course. Kizzire and Harman highlighted their day sandwiching a par-5 14th hole eagle ‘3’ in between birdies on 13 and 15 while they also combined to birdie 17. GMac and Grillo, producing the past two days one of the most bizarre post-birdie congratulatory handshakes ever seen, were out in two-under thanks to three birdies and a bogey and then had the ‘pedal to the metal’ with five birdies in succession from the 10th hole to storm their way to a then three-shot lead at 20-under par. However, the pair let slip their advantage with a bogey at 15 as others in the field caught the pair. Only one ‘all-international’ team has won the Shootout in its 30-year history and that was, still tournament host, Greg Norman and fellow Aussie Steve Elkington in 1998. McDowell had teamed with Shane Lowry a year ago to finish runner-up to be among just three ‘all-international’ teams to end second and it’s no surprise McDowell would dearly love to go one place better in Sunday’s ‘better ball’ format and secure a first victory of any sorts since capturing the 2015 PGA Tour OHL Classic at Mayakoba. “I think I’ve had a couple of seconds at this event so I need to look back at the record books but I finished second here last year, and I’m pretty sure I’ve been close a couple of other times as well,” he said. “Hopefully this weather can behave itself tomorrow and we can get out there and get 18 holes in and really try and contend in this tournament”. And when asked what McDowell thought what score would ensure success. “A 59 gets it done again,” he said smiling. On a separate note there was more good news for McDowell as he confirmed he’s signed a new deal with Srixon Golf for 2019. “I’ve just redone a new Srixon deal, so I’m excited to be with them going forward,” he said. “I kind of started working on some off-season technique last week, and it’s kind of been a scrambling week for me trying to get back to just play mode a little bit. “So, kind of, hence, why I struggled a little bit earlier in the week. I managed to get it going today”.